Does Raw Garlic Promote Hair Growth? One fact about garlic is undisputed: it smells very, very strong. Ancients believed that the stronger the herb, the more powerful its effect, and pungent garlic was used for everything from dissuading vampires to promoting hair growth. While there have been no significant studies on the effect of garlic on hair loss as of August 2009, scientists have studied the positive effects of onion juice on hair regrowth. The similarities between onions and garlic lead some to believe that garlic may also be beneficial for regrowing hair. In a study published in the June 2002 issue of "The Journal of Dermatology," scientists outlined the positive effects of onion juice on hair growth. A group of 23 patients applied onion juice twice a day; 86.9 percent of patients experienced regrowth after six weeks. Onion comes from the same family as garlic, the allium family, and its positive effect on hair regrowth comes from its high sulfur levels, which characterize all members of the allium family. Garlic has high levels of allicin, a sulfur compound. Allicin is a very strong antibiotic that helps the body to kill germs and prevent them from reproducing. Garlic's strong smell comes from allicin, which is released when the garlic clove is crushed, cut or bruised. Due to its antibacterial properties, garlic can rid the scalp of toxins and promote scalp circulation, both of which are essential for healthy growing hair. It's also good for relieving scalp dryness. If you're balding, thinning, or just want to encourage new hair growth, apply garlic directly to your scalp before bedtime. 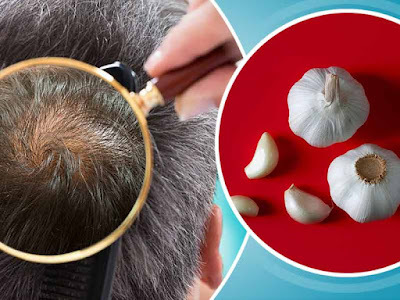 One hour before you sleep, cut open a clove of garlic and rub all over your scalp. Squeeze the clove as you rub to release the garlic's juice. After an hour, massage your scalp well with olive oil. Sleep with a plastic shower cap, or cover your pillow with a towel. Shampoo in the morning. For those who can't stand the smell of garlic, whip up a nicer-smelling treatment. Mix together 1 1/2 tsp. chamomile tea, one egg yolk, 2 to 3 tsp. water, and 1 tsp. each of the following: aloe vera gel, honey and garlic extract. Massage the mixture into your scalp with firm, circular motions. Leave in for 20 to 30 minutes, and shampoo as usual. The more sulfur in your garlic, the more benefits you may reap, so make sure you're buying the best garlic around. At the grocery store, pick out the freshest, strongest-smelling garlic you can find. The stronger the smell, the higher the sulfur content. Organic garlic is thought to have a higher sulfur content than regular garlic.